Ally has a long-standing relationship with the family-owned Koke washing station, which was built in 2011 and has seen many improvements since 2015, when the washing station staff began providing guidance to contributing producers regarding steps to take for increased coffee quality. We have been providing feedback and purchasing the best lots of Natural and Honey coffees for several years, and we look forward to many more years of fruitful partnership. The Koke station stands on the side of a hill, with coffee grown above and below the station. For the last three years, the Koke station managers have been separating out the higher elevation cherries for Ally, and the quality clearly shows. 96 small scale farmers provided cherries to Koke this harvest, most of them multigenerational family farmers. 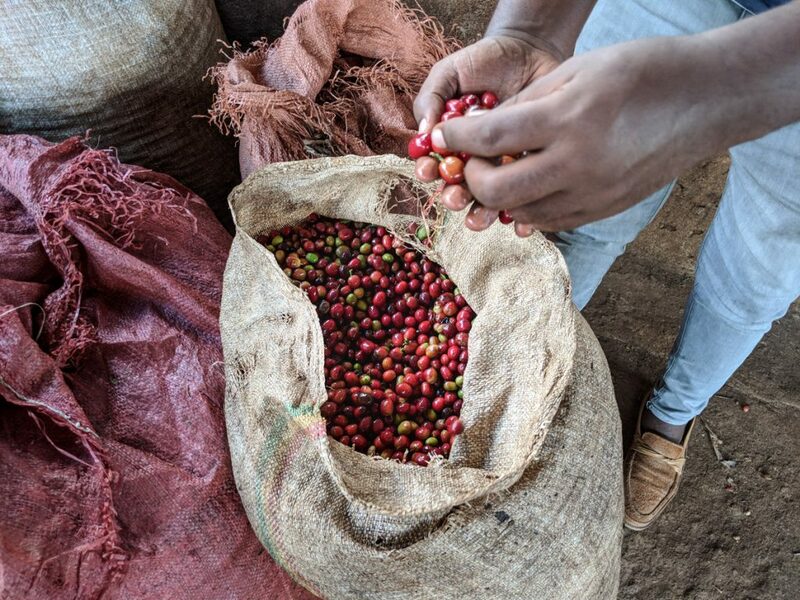 Their many generations of experience is evident in Natural coffees that are dried on the washing station’s 106 raised beds for 21 days before resting for a month in a well-ventilated storehouse. Cherries are sorted by hand upon arrival to the washing station to remove the less dense cherries. 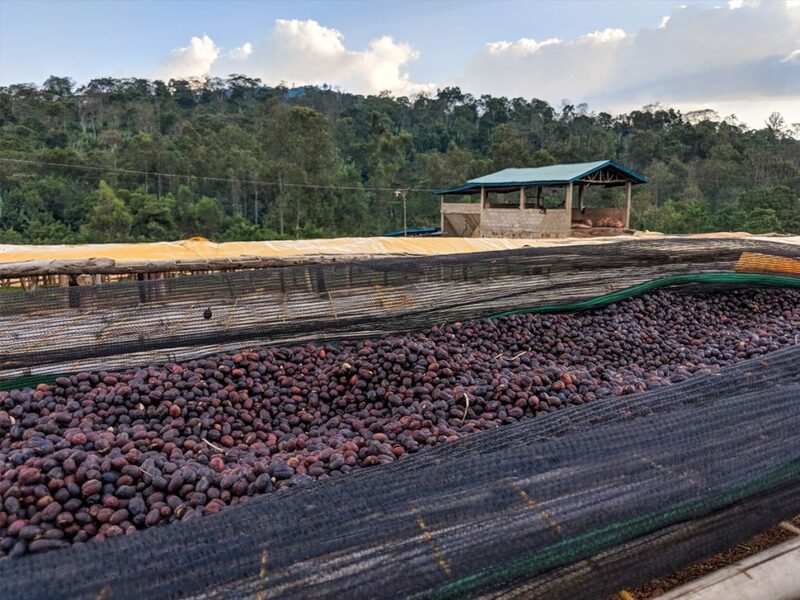 Tarps are often used to keep the coffee from drying too quickly and losing its beautiful and characteristic cup profile. When coffee is dried inside the cherry, it is milled to removed the dried pulp and parchment at the same time. Green coffee is color sorted prior to export. Koke Natural was prepped for export at Tracon Trading’s coffee cleaning and storage plant on 30,000 sq meters of land in Addis Ababa. The plant is equipped with modern Pinhalense coffee processing machines and a Buhler Z+ color sorter. The machine has the capacity of processing six tons per hour. All the processing jobs are mechanical and electronic including final hand picking on conveyor belts. The six storage silos of the plant have a capacity of accommodating about 15,000 metric tons of coffee at a time. The warehouses are clean, with ample lighting and ventilation, which are very ideal for keeping the quality of the coffee. Literally translated as “Land of Many Springs,” Yirgacheffe has the ideal topography, elevation, and water sources to produce and process exceptional coffees. Yirgacheffe is one of the woredas, or regions, of the Southern Nations and National Peoples area of Ethiopia, which is home to 45 distinct people group. 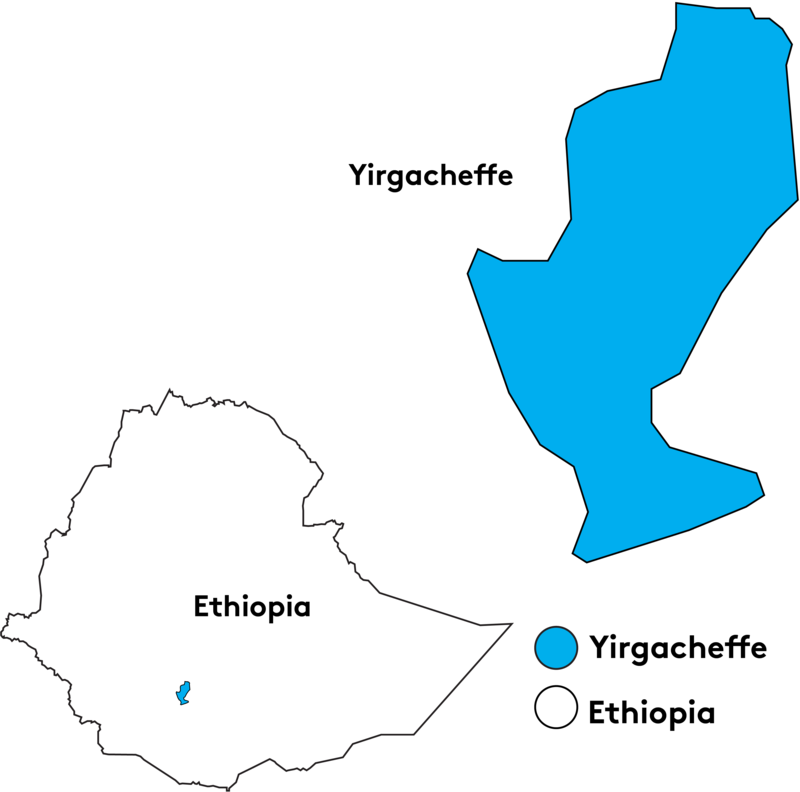 Part of the Gedeo Zone, Yirgacheffe—named for its main town—is bordered to the south by Kochere, to the west by Oromia Zone, to the north by Wenago, to the east by Bule, and to the southeast by Gedeb. The Yirgacheffe woreda is 409km from Ethiopia’s capital of Addis Ababa and has a population of almost 200,000 people, less than 10% of whom live in urban locations. Coffee farmers in Yirgacheffe are typically multi-generational small-scale landholders, sometimes with only a few acres of land. Most coffees in Yirgacheffe are sold as cherry to centralized washing stations that help further separate flavor profiles. Many farmers also grow the subsistence crop enset ventricosum, also known as false banana. Yirgacheffe is considered by many to be the birthplace of coffee and the coffee trees grown in the region are a naturally occurring mix of heirloom varietals cultivated among other species in coffee gardens and coffee forests. Washed Coffee was introduced to Ethiopia in the 1970’s, and Yirgacheffe was the location of the first wet processing mill. The climate in Yirgacheffe is warm and temperate. In the winter, there is much less rainfall than the summer, with an annual average of 1525mm and a difference of 246mm of precipitation between the wettest and driest months. The average temperature across Yirgacheffe is 18.4 degrees Celsius.